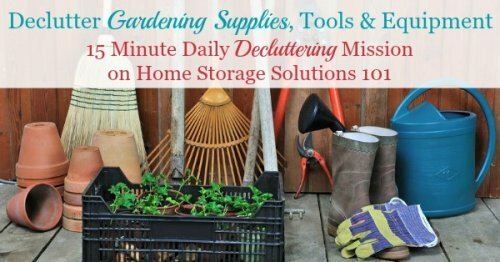 Today's mission is to declutter gardening supplies, tools and equipment from around your home and yard. 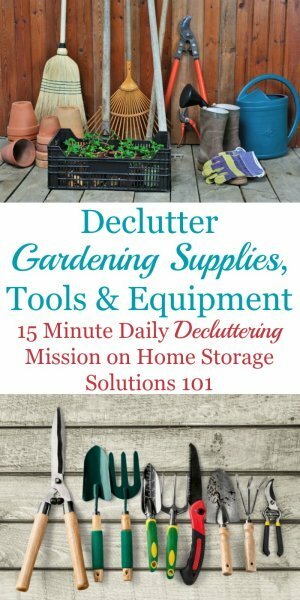 This mission is designed to be done while working through the Organize Outdoor & Garden Storage Areas Challenge here on the site, which is part of the 52 Week Organized Home Challenge. This is a good time of year to do this mission, as the weather begins to get cooler and it's time to clean up your yard and garden areas for the coming winter. Of course, you can do the mission whenever you need to though. To make sure this mission isn't overly broad, and can be done more quickly, today I want you to focus on smaller gardening tools and equipment, as well as supplies, while tomorrow's mission will focus on additional larger yard tools and equipment. 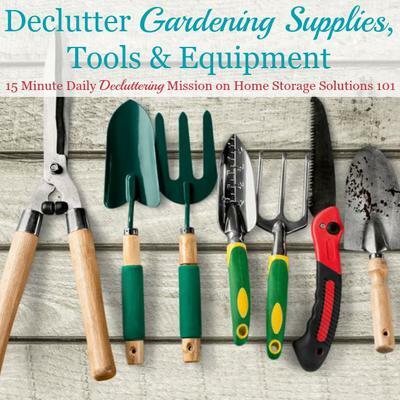 Examples of items you should consider decluttering today include small gardening hand tools, gloves, buckets and watering cans, pots, potting soil and fertilizer, seeds, vegetable stakes and cages, and similar items. Equipment that is used to maintain not just flowers or gardening, but also the yard in general, will be the focus for tomorrow. I know there can be a lot of overlap between these categories, and so to the extent there is, think of it as having a couple of days to get this mission accomplished! suggesting that you get rid of all your garden tools or equipment, especially if you use it regularly. Instead, this mission is supposed to be a time where you examine the supplies you've got, and keep only the items that you regularly use, and that still work, so the process of gardening will be easier and more fun in the future. Get rid of anything that is broken and you reasonably know you cannot or will not repair. Similarly, if any of the seeds or similar items you've got are past their prime, dispose of them as well so you don't get confused between what is fresh and what is too old. Also, get rid of duplicates, keeping the better of the tools or equipment, if you find you never use both of what you've got. Further, now that it's the end of the growing season you can assess what you actually used this year, and what you never used at all. Seriously consider getting rid of items that you didn't even use this year at all, instead of storing it for yet another winter. Finally, use the opportunity of this mission to properly clean and store any garden equipment and tools you do decide to keep, so that everything will stay safe over the course of the winter and be ready for use again when it's time. Below I've shared some photos from other readers who've already done this mission to get you inspired and ready to tackle it yourself. Several readers have already done this mission and have sent in photos showing their results. 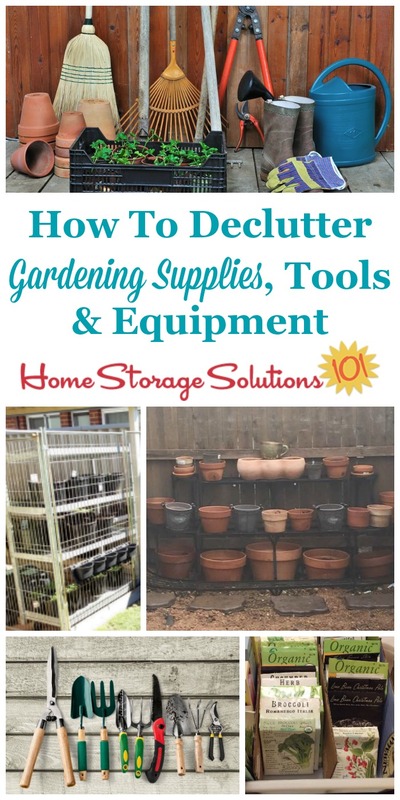 I hope that these photos will inspire you to clear your own gardening tools, equipment and supplies clutter to make both your garden storage areas, as well as yards and green spaces look their best! 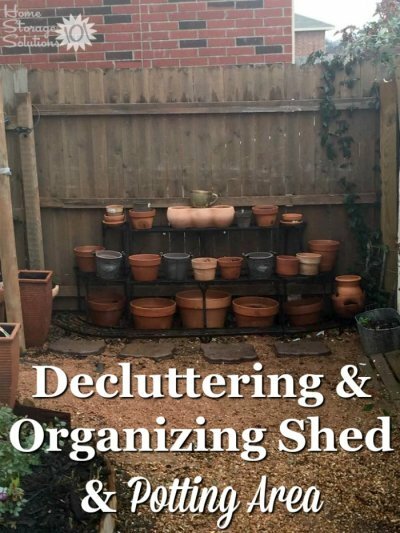 The photo above is from a reader, Tamara, who said, "Decluttered my shed and potting area!" 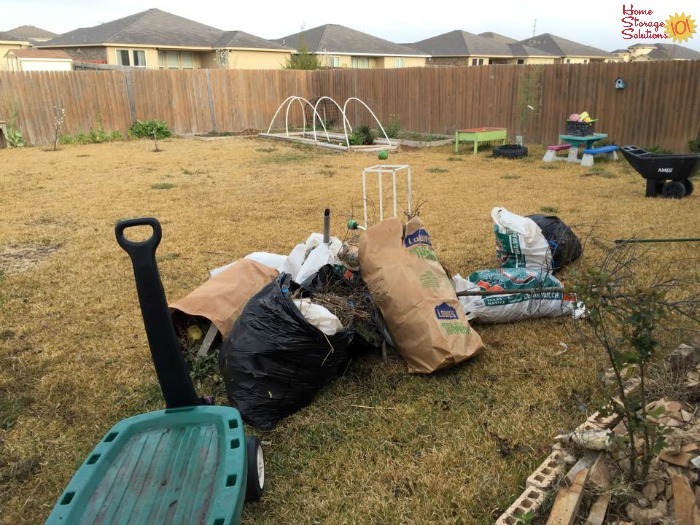 Tamara also sent the photo below, where she explained, "Decluttered the back yard and some of the veggie beds." Finally, this last picture below, is from a reader, Dany-el, who said, "We decluttered this area in our rental which was full of rubbish and weeds from before we moved in. We then set up some free standing fence panels, made hooks from old wire coat hangers and hung some pots. 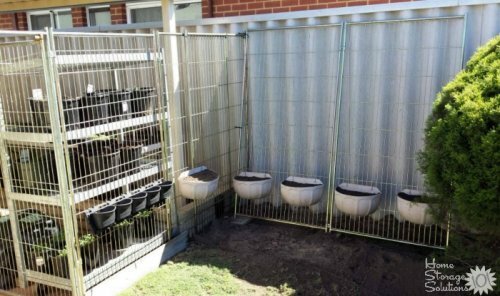 It's now ready for our pea and bean seedlings." Great job to everyone whose already done this mission! These areas look great! The advantage of getting rid of the clutter from your garden and supplies is that once you do, it's much easier to get what you've got left organized and ready for use. The photo above was sent in by a reader, Karin, who worked through this mission. 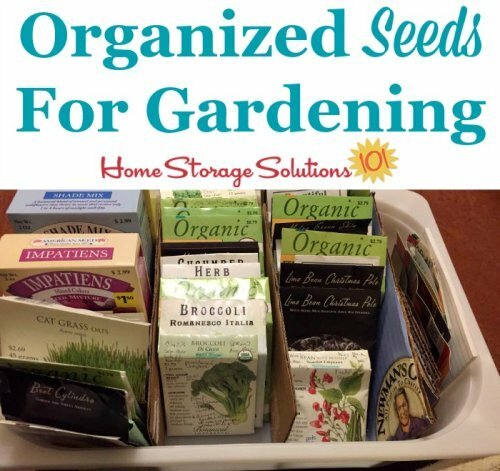 She said, "hubby just helped me get my seeds organized in a single spot!!!" That will make it so much easier to find them when you need them, which is why organization (and decluttering) are so great! Doing this mission will make the whole process of gardening so much easier, and a lot more fun! I hope seeing these pictures has inspired you to get rid of your garden tool and equipment clutter.